WHAT IS A CRUST FUND? 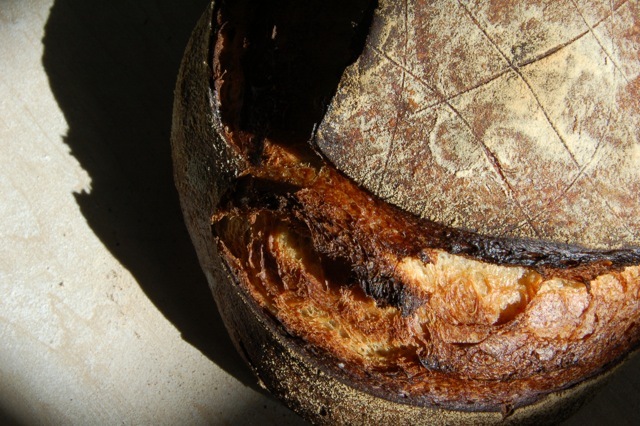 A Crust Fund, or Breadshare, is essentially the same model as a "CSA", or, in this case a "CSB"--a Community Supported Bakery. You put money on account, and you specify in advance the number of loaves you would like, and the place you would like to pick them up. You don't have to do this every week; you can just set it and forget it. If you sign up for, say, one loaf every Friday at Ithaca Made, we'll bake it for you every Friday. We'll start your loaf on Wednesday, and we'll bake it Friday. Then we'll bring it to Ithaca Made for you to pick up. To be more precise, it's not that we bake that specific loaf for you. We bake you a loaf, which you pick from all the loaves remaining at the table when you get there. We come with LOTS of bread of many types, so early birds get lots of choice. Late comers not so much. But we always try to have plenty of everything, and we are always ready to work with you to make things easier if we can. If you want to get even more particular about what your share means, you can think of it this way: You are hiring us to bake for you, and to bring the product of that bake to an agreed upon location and to hold it until the distribution is over. You are not buying a loaf of bread; rather, you are hiring us to bake! Strange, I know. But true nonetheless. What does this mean? It means that when we get that loaf to the distribution site, and once we have held it till the end of distribution, our part is done. We can’t guarantee that you will come get it! But what if you have to go away? Let's say…you are invited to go to Moscow to discuss a new hotel. What then? Such deals, I’m told, can take some time to work out, and you might not want to fly home just to pick up your bread! We have thought of this! Here's what you can do: when you set up your Crust Fund, you automatically set up your own account page. On that page is a "delivery hold" calendar, and with that neat little widget you can simply put your bread on hold. We won't bake it. You won't get it. And you won't be charged for it. You can make your deals without worry. Simple! Once we've started baking for you, the window for change closes, and you can't put your bread on hold. That window closes THREE DAYS before the bake. Why three days? Because it takes that long to bake your bread! Finally, it is first-come, first-served. We bake MANY kinds of bread, and we try to have bread from every corner of the bread universe available for you on your pickup day. But we don't hold particular varieties, and we don't guarantee to bake particular varieties. It's first-come, first-served. That said!... tell us what you like, what you'd like to try, what cool bread you've heard about.. we want to know. We are always interested in baking for you the bread you love. And we want to share with you the bread we love. You can sign up for a Crust Fund at any time, and YES, we do still have room for new members. But wait, there’s more. When you become a member, you get your weekly bread for $5.50 a loaf, which is $1.00 off the retail price of $6.50 ($7.00 at most markets!). AND, if you want additional loaves, you can buy them at the member price of $5.50 (this is assuming that there are extra loaves to be had). AND if you see us at the Farmer's Market, where we sell full-size loaves for $6.50 or $7.00, you can buy them for $5.50. Here’s the one caveat: IF YOU DON’T COME GET YOUR BREAD, THE BREAD IS GONE! We know you understand why! Our system is now credit based. You don't purchase "weeks" or "seasons." Instead, you simply put money on your account. As long as you're getting bread, we're deducting from the account. Whenever you're on hold, we don't bake for you, and your account sits untouched. It’s simple. You have money in your account, and when it runs low we will send an email to remind you that it’s time to update it. You can pay on-line with Paypal, E-check, or Credit Card. You can also pay by check or cash when you see us, or drop the funds in the mail. One weird thing about our system is that you CAN NOT CANCEL IT ON YOUR OWN! There is no button to click that will cancel your breadshare. Even if your account runs out of money, the breadshare will not be cancelled! I know. It’s weird. But so are a lot of things.. and this is just one more of them. If you do need or want to cancel your account, we ask that you send us a NOTE! You need not explain or apologize; we are grown-ups. You can just write: Cancel Please.. Of course, many people do send lovely notes, and we do appreciate them. Not to say that we won’t appreciate YOU if you don’t send a lovely note, but the lovely notes are nice. Good-To-Go, Trumansburg, NY. 4:00pm - 6:00pm. Ithaca Made at the Dewitt Mall, Ithaca, NY. 4:15pm-6:00pm. Ithaca ReUse, Triphammer Mall, Ithaca NY. 4:00 - 6:00pm. Seneca Sunrise Coffee, Watkins Glen NY. 4:00 - 6:00pm. Linden Social Club, Geneva NY. 12:00 - 2:00pm. Ithaca Made at the Dewitt Mall, Ithaca, NY. 4:15pm - 6:30pm. **We typically bring enough bread to our pickup sites for non-members to buy loaves. During the summer months, we also partner with a number of local CSAs, and offer our bread alongside their vegetable shares. If you are part of the Full Plate, Plowbreak, or Sweet Land Farm CSA, send us an email to learn how you can start getting bread along with your weekly vegetable share! Interested in learning more about the crust fund? Find our more on our Crust Fund page! We work in partnership with Oechsner Farms, which provides most of our grains. Farmer Ground Flour, located only a mile from the bakery, mills most of our flour. We, at the Wide Awake Bakery, bake. We make many varieties of BREAD, PASTA, GRANOLA, PASTRIES, and COOKIES from scratch using local and organic ingredients. You can buy bread through our CRUST FUND (read on for more details), as well as a rotating selection of pasta, pastries, cookies & pretzels. You can also buy bread RETAIL at stores around Ithaca & Trumansburg - scroll down for a complete list of retail locations! Our delicious pastries are available at all our distributions and at the Farmers Markets we serve.